Hi ladies, the day is finally here! Alex and I will be heading down to Somerset for the annual Glastonbury festival today. I'm still quite excited and don't know what to expect so I packed a variety of outfits alongside my rain jacket and Hunter wellies. Gypsy Blouse*: A plain white, casual gipsy top is a must-have for the summer and you'll see them everywhere at the moment. Those light and airy tops are great to protect you from the sun or to throw over your bikini after a long day at the beach. The studded details and front lacing reflect the current 70's vibe which is perfect festival wear. How cute are those tassels? I can see myself playing around with them all the time. What a fabulous detail! My blouse is from the current Blue Vanilla collection. Sunglasses*: Oh what would a festival be without a pair of fabulous sunglasses? They are a true festival essential but I wouldn't bring along Ray Bans (I'm too scared they get damaged or stolen). In this case, I opted for a more affordable version from GlassesShop which offer a wide range of cheap sunglasses and prescription eyeglasses. There are different styles on their website with prices starting from $12 onwards and you can upload a picture of yourself to 'try' them virtually on. I love the round shape of these ones and there are small gold details on the frame which make the glasses look super stylish. If you're after a cool pair that won't break the bank for your festival style, then it's your lucky day as I got a 25% discount for you. Enter LOVEGS at the checkout (ends 30/09/15). Accessories: The lace up detail from the blouse is already eye-catching and I personally wouldn't add a necklace to it. Instead, I opted to team my outfit with stylish sunglasses and a saddle bag from Stradivarius. If you're a regular reader of my blog you know how much I love Stradivarius and this bag was a real bargain. It's currently in the sale for £5.99! It has the right size for me to bring along my camera and some money. I don't really fancy carrying water around all day so for me the size of the bag is perfect. The strap is adjustable and It has a safe lock so it'll be hard for pickpockets. 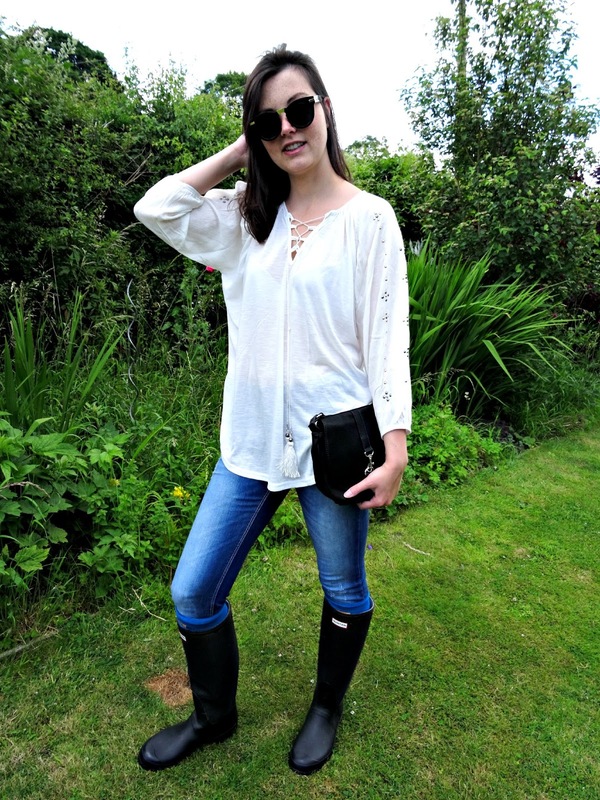 This outfit is of course for the more cloudy days, but it still makes a fantastic summer outfit as the blouse is light and airy and so casual. Let me know what you think of the outfit, I'm looking forward to your comments. 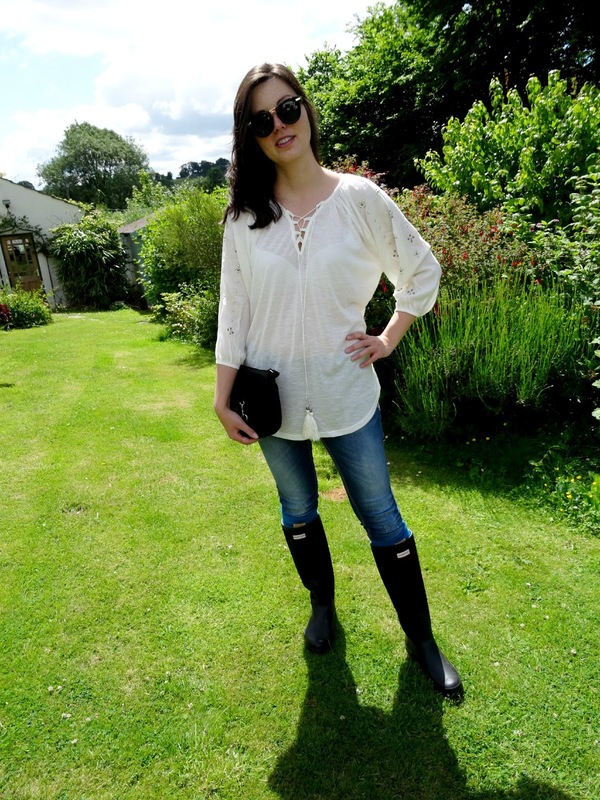 Please also see my Glastonbury Festival Outfit Day 2, Glastonbury Festival Outfit Day 3, Glastonbury Festival Outfit Day 4 and Glastonbury Festival Outfit Day 5 outfit.